I just came back from a 10-day visit to my hometown, San Francisco. There’s a lot I want to write about San Francisco. And by a lot, I mean a book’s worth. 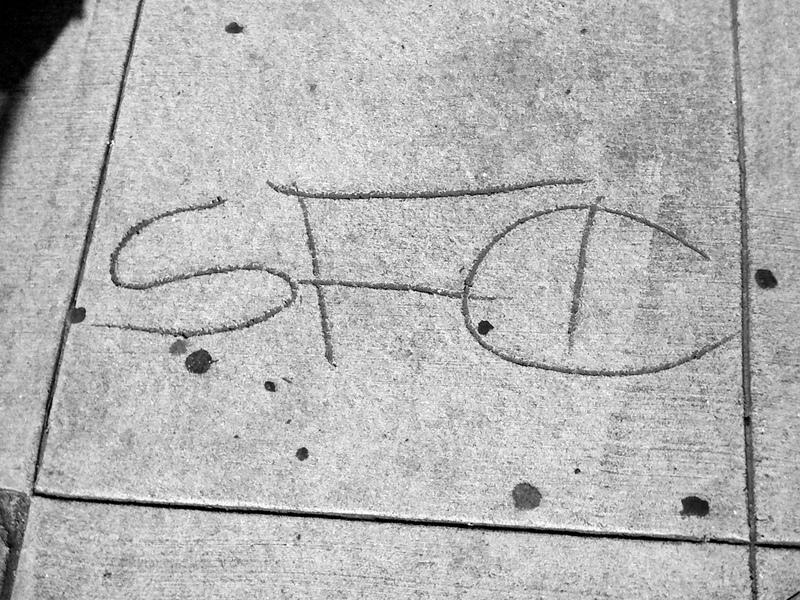 Sidewalk graffiti on San Bruno Avenue, San Francisco. "SFC" stands for "Sucka Free City." But while I struggle to form my Grand Theory of San Francisco, I’ll settle for a collection of tidbits, which sometimes are the best way to describe an unquantifiable entity. Here’s one: an enduring discussion about whether or not “Frisco” is a legit nickname. The issue recently came up on Sparkletack, the excellent blog of the San Francisco history podcast, which links to a nice post on Frisco Vista from a couple of years ago. I agree much with the latter’s conclusion that attempts to control how SF’s inhabitants refer to their city are stodgy and insecure. “Frisco,” it seems, has long been a tough-guy way to talk about The City. See, for example, the Cellski/Andre Nickatina song Frisco (warning: it has bad language and terribly violence-glorifying lyrics, which I only link to to prove a point, not celebrate). 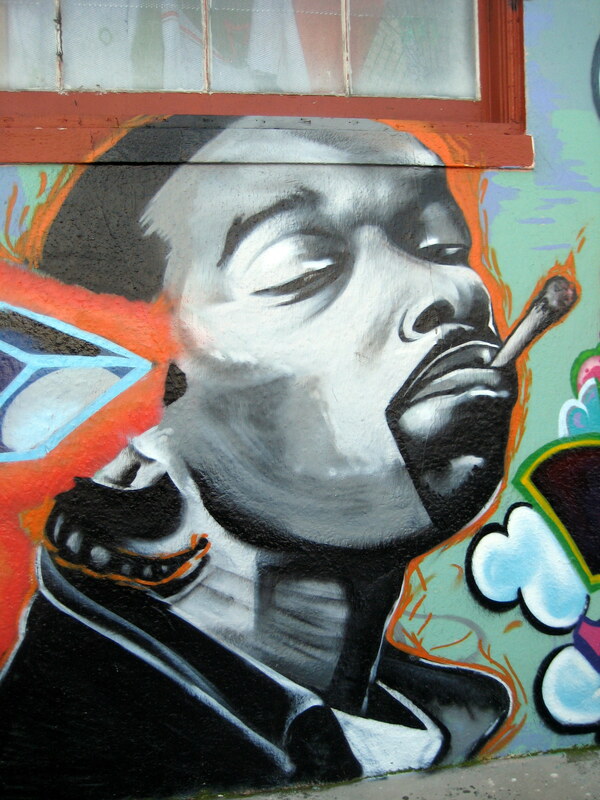 A mural on San Bruno Avenue, San Francisco, depicts Andre Nickatina, a.k.a. Dre Dog, the SF rapper who sang a verse on the song "Frisco." It’s undeniably cheesy for San Francisco ears to hear Midwesterners, out-of-state news anchors and Hollywood characters call our city “Frisco.” It’s like a stranger using a term of endearment for someone close to you. It sounds either presumptuous or corny. But it also seems possible that an effort to keep “Frisco” taboo is an effort to keep The City classy — a symptom of chafing against the riffraff’s lack of sophistication, and an impulse to try to control what The City represents. Of course, just about every community in the consolidated city and county is guilty of a similar impulse in some way. According to the rap song linked above, for example, San Francisco is the “land of homicide;” but for lots of other people it’s the land of Priuses, community gardens and medical marijuana; for others, it’s a place to enjoy the good life of world-class wines and fancy restaurants. All are partly true, depending on how you experience The City. They’re also all fantasies, as they are totally incomplete. The anti-Frisco bandwagon smacks just a teensy bit of elitism — perhaps born of an old-time insecurity about just how fine of a city it is. This is a touchy subject in a city that is losing working class neighborhoods like a bad habit. To me, “Frisco” is a rusted truck sitting under some eucalyptus trees in the September sun, against a backdrop of yellow grass and sun-bleached wooden houses. * It’s the weeds in the Caltrain tracks off Visitacion Valley. It’s kids drinking beer on hilltop parks at night, after all the dog-owners have gone home. It’s the orange lights of projects in the Alemany “wind tunnel,” next to a freeway that roars along on an old creek bed where, 150 years ago, water once gurgled. It’s the Beach Chalet bushes, barnacle-clad rotting pilings in green water, abandoned shipyards. It’s that street on the far side of Potrero Hill that you never walked down. It can be quite scratchy around the edges, but it’s a real and often beautiful part of The City. Of course, in the end, San Franciscans will call their community whatever they want — in fact, we’ve got a long track record of doing whatever we want, anyway. From H.P. to the Castro, we’ve pretty much proved that by now. I know that street on Potrero. I sat next to Fat Willy on the school bus every morning as we drove down it…(sup, Eamon — good stuff btw). Beeeen! It’s because of lazy afternoons in your neighborhood, spent in pursuit of Calvinball, that I have any close-up familiarity with P.H. in the first place. Keep up the good work with DCQ. Viva San Francisco. It is also the way people whose families were in the west before Ellis Island accepted its first immigrant referred to SF. Denver was the Queen City of the West, and SF was Frisco. Chicago was the Gem of the Prairie, and Portland was renowned as the most vice ridden city on the west coast. The Barbary coast was tame by Portland’s lights; SF was seen by the old timers as being like a Sunday School girl being daring by holding a boy’s hand behind a tree during the young people’s picnic, while Portland tried to pass herself off as a stodgy matron while making both the Barbary Coast and Storyville look like camp meetings. What is now the Pearl District, all the way up and down the river from Burnside to around Yeon, was once the bordello area in Portland, and the old bordellos became skid row hotels and private houses before gentrification replaced then with yuppie high rise apartments. The situation in Portland was so notorious, that the city council passed an ordinance requiring that the property owner’s name be prominently displayed on the front of the lairs of the soiled doves – and the good businessmen of Portland responded by putting up signs with their names written in Arabic, Hebrew, Chinese, Hindi, Japanese, Russian, etc. There are wonderful old pictures of the Ladies of the Evening leaning out of the windows in broad daylight, apparently to both solicit custom and acquire tans without mess lines. Which is why the city council really wanted to know who owned the buildings so they could at least make them wear some minimum garments while soliciting. I got the distinct impression growing up that the only “evil” associated with Frisco was a result of the 1906 earthquake. It seems that the loss of public records provided an opportunity for those who wished to become someone else someplace else. Illegal stowaways, escaped criminals, and others suddenly were all “born in Frisco” as it was impossible to verify or deny their antecedents. In other parts of the west, one old line to describe someone of questionable honesty was to wonder if he was born in Frisco – i.e., was running away from his past. It was not uncommon for those who were not US citizens but wished to serve in the Coast Guard to claim birth in San Francisco.